As temperatures linger in the triple digits at the end of summer, you’re probably looking for ways to cool off in Palm Springs. While you can always escape the desert sun with a trip up the Palm Springs Aerial Tramway, you don’t really have to travel very far to escape the heat. Another top choice for poolside lounging is the laid-back Viceroy Palm Springs, a chic boutique property known for its modern interior design. Step outside of your room, though, and head to one of the relaxing pool areas to work on your tan, as you sip on fresh fruit smoothies and chilled water from one of Viceroy’s three cabana options. The Riviera Palm Springs has long been known for its high-energy pool scene, complete with pool parties, entertainment and a poolside bar that makes it easy to lounge by the water all day long. The new Chiki Bar and pool area invite you to lose yourself in a tropical oasis in the heart of the desert, but don’t spend the day waiting for a lounge chair to open up: instead, book yourself one of the plush cabanas that sit poolside. You and up to 9 of your friends can enjoy the ceiling fans and misters that keep you cool as you relax on sectionals and chaise lounges between pool sessions. 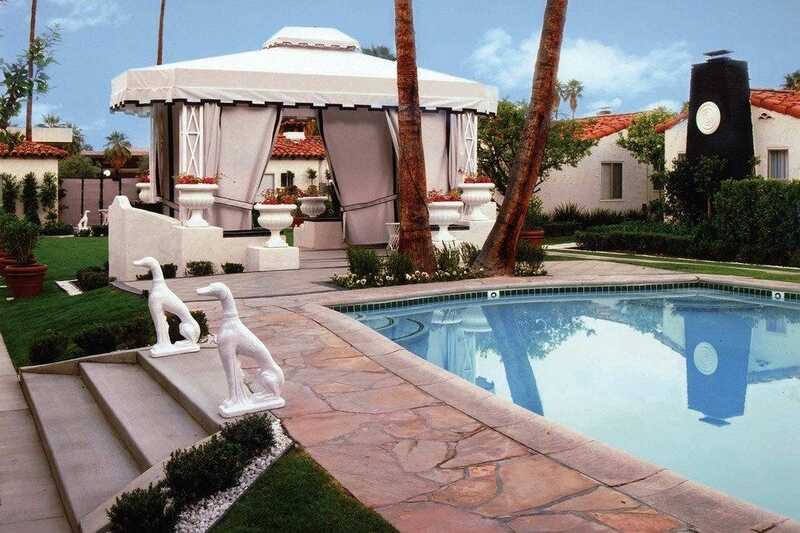 Plus, a flatscreen TV, champagne and fresh fruit help you unwind in true Palm Springs fashion. Over in Indian Wells, you can relax by the pools of the Miramonte Resort and Spa, where a poolside bar keeps the libations flowing at the main pool. Adults can find their relaxation time at the adults-only pool near the rear of the property, while your zen awaits you at the tranquil spa pool. The Linger Longer package lets you enjoy the pool until your late checkout at 4 p.m. If you’re headed outside of Palm Springs, you’ll be hard-pressed to find a better hotel where you can kick back by the pool than Rancho Las Palmas in Rancho Mirage. Not only are there adult and spa pools if you’re looking for a bit of tranquility, but you’ll also find plenty of fun ways to keep cool at the resort’s Splashtopia water park, complete with a wave pool, water slides and a sandy beach. You can beat the desert heat your way as you splash your way across this water park. Book your stay at Rancho Las Palmas with the Stay Cool package, and you’ll get two free inner tube rentals and a $50 breakfast credit, too. Discover even more hotel options in Palm Springs. Marissa Willman is a Palm Springs-based travel writer who loves hanging by the pool when desert temperatures reach the triple digits.